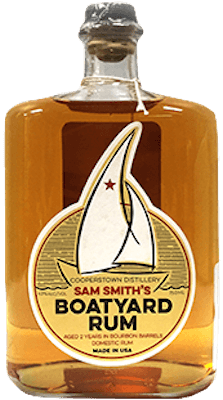 Have you found an online vendor selling Sam Smith's Boatyard? 43% ABV. Distilled in Florida. Aged 2 years. Pleasant nose and palate. I'm guessing pot still. Nothing exceptional, but certainly one of the better American craft rums I’ve tasted. Note: The brand should probably be Cooperstown Distillery, not Sam Smith's. I was gifted a bottle of Sam Smith's boatyard rum for Christmas and got around finally to polishing off a bottle of it. While I will note I am a fan of domestic rums this one went I feel a bit off our normal American craft routes. By that I mean this rum was distilled in Florida and then barrel aged in New York. Much like the bourbon and whiskey markets this rum could be compared in that the distillate was made elsewhere then aged and bottled. This rum is a 2 year aged rum. It is aged in used bourbon barrels in Cooperstown NY. The rum is from an unknown distillery in Florida made from GMO-free molasses. It is bottled at 43% ABV. My questions to the Cooperstown distillery about this rum have been not been responded to. Though there is a huge story I will not go into behind this rum. Now down to the profile of the rum. The nose is that of bottom shelf liquor. It is has an astringent, alcohol, unpleasing nose. The taste is initial alcohol, faint spice with no bite, faintly comparable in rum terms in flavor vaguely to Cockspur fine rum. The difference is a burn in the throat. Not many US rum's aged 2 year I would say have an intense burn yet this rum does. The burn from straight tasting is very evident. The burn on its finish nearly destroys any flavor this rum is attempting to portray. So what went wrong here as there are many American rums of this age or lesser that work? The rum was not made in house it was purchased most likely from a mass producer from a column still rather than a pot still. Then put into barrels then a lack of proper cooperage took place with no care to monitoring the barrels which were most likely very used more than three times. Then the producer made the choice of a higher ABV rather than merely producing at 40%. This rum was far too hot to go above 40% in its current state. American rum done well at 2 years is made in pot stills in one time used bourbon barrels carefully monitored before release. This was a very hard rum to finish off. At 25-30.00 per bottle this rum could have been so much more. Instead it is a failure on multiple levels with a story that is ten times larger than the liquid inside it. Also the bottle is a total failure the cork is so small it is hard actually to take out. I replaced the cork with a larger version the glass lip on the bottle is so large compared to the small plastic covering of the synthetic cork that it is actually hard to remove. I used the Caliche cork that has a nice fat wooden topper. Overall one of the worst domestic rums I have ever had. Possibly the worst domestic aged rum I have ever had. I suppose that's what happens when you buy bulk column distillate then dunk it in very used barrels then blend it and put it into a poorly designed bottle with more care for a story on the back of the bottle than what's in it. We need to quickly stop domestic rum being bottled at craft distilleries of unknown distillery and quality based on this fireball.